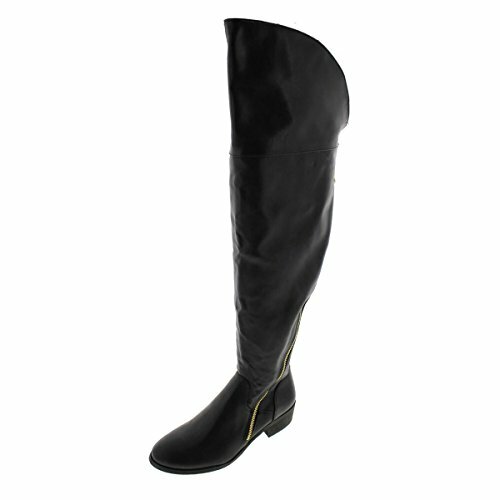 Be a fabulous fashionista in the Report Gwyn tall boot. This women\'s over-the-knee boot is crafted from supple, buttery-soft vegan leather upper adorned with a sleek asymmetrical zipper that wraps the leg for a wealthy, edgy vibe and simple on/off. The Report Gwyn minimal-heel boot has a slip-resistant synthetic sole for a positive-footed stride. Crafted from supple, buttery-soft vegan leather upper adorned with a sleek asymmetrical zipper that wraps the leg for a rich, edgy vibe and easy on/off. Cutting edge Report styles have also been featured in Teen Vogue, Cosmo Girl, Seventeen, Nylon, and Glamour.